The exhibition "A Certain Strangeness" opens on June 6, 2019 at the Bonnefantenmuseum in Maastricht, Netherlands and it will offer an overview of Andy Summers' photographic work from the period 1980-2017. The geographical range of the images varies from the Alto Plano in Bolivia to the alleys of the Golden Gai in Tokyo. In addition to a preference for night shots, the work is characterized by a sense of intimacy, surrealism and a dynamism that can best be described as 'in media res'. Summers sees photography as the visual counterpart of his musical practice. Part of the exhibition is a series of photographs that Summers made during the tours with The Police. This series will be on shown from June 8-10, 2019 in the Bonnefanten Pinkpop-up museum exactly 40 years after the band's only Pinkpop performance. Summers will also give a concert during the opening of the exhibition in the Bonnefantenmuseum. 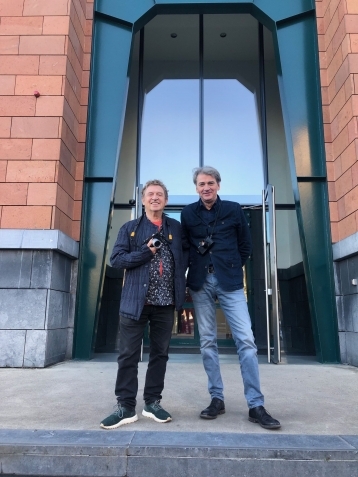 Andy Summers shares this about the forthcoming exhibition "A Certain Strangeness" in the Bonnefanten: “It’s good to be back in Maastricht after so many years. The performance at Pinkpop festival in 1979 was - in a way - the kick start for the career of our band The Police. That year and the beautiful city of Maastricht hold a special memory for me. The Police played at the Pinkpop Festival, we had our first number one record and my interest and passion for photography was born. I am very pleased to have this exhibition at the Bonnefantenmuseum. It accounts for the time that I have been away! I am also pleased to be performing at the opening”. "A Certain Strangeness" will be on display June 6th - October 27th, 2019. The pop-up exhibit at the Pinkpop Festival will be on view June 8th - 10th, 2019.